This the opening paragraph to the forestry section of the first “Annual Report on Reforms and Progress in Korea”, published in 1907 by His Imperial Japanese Majesty’s Residency General (Japanese governmental authorities seemingly were not bold enough to assert their role as a Government General until the year of annexation in 1910), in Seoul is an essential summation of the Japanese few on Korean forestry management. Coupled with later statements that Korea has “no forestry law to speak of” speak of great conceptual difference between the classical, bureaucratic legalistic approach of Imperial Japan and that of the Choson dynasty. It is of course difficult in a sense to assess the fairness or otherwise of Japanese claims so far as Korea’s ineffectual and uncoordinated approach to forest and timber resource and management, difficult as the chaos of the later Yi dynasty meant that whatever institutional systems and records that had been undertaken in the later years within Korea’s forest sector are essentially lost to us now, if they were ever accessible and obtainable to foreigners and externally interested parties. Equally as has been asserted many times and many scholars Choson Korea and the institutions of the Yi dynasty were simply not that sort of institutional or developmental state. While Yi dynasty Korea had a highly developed and deeply organised bureaucracy and civil service (which of course was intricately embedded with social stratification), in the Yangban classes and the Civil Examination process, it was not that sort of bureaucracy, focused primarily as it was on the maintenance of the Royal House, specific and general structures of social order and the difficult tenuous relationships this Korea had with its favoured partner China and the outside world. As we have seen in the previous section, the institutional structures of Korean forestry were not the intricate works of bureaucratic organisation of Japanese history, but neither were they subject to amateurish neglect of the colonial imagination. Whatever the reality of this past however, its present manifestation did not suit the needs and requirements of the colonial administration and it was keen to make radical changes tailored to its agenda. Accordingly the Residency General negotiated and undertook what it describes as a ‘joint’ enterprise with the Korean Government in building a new forestry coordination and trans-shipment centre at Antung (present day Chinese Dandong), opposite the Korean town of Sinuiji (which the document describes as Wiju), on the mouth of the Yalu. This served to coordinate and develop timber shipments along the Yalu River from the deep northern interior forests of North Pyongan and Chagang provinces. The annual report notes the extent of the timbers journey: “…The distance from the place where the timber is felled to the main station at Antung is 150 ri (375 miles) and the rafts take 40 days to make the journey…” (HIJMG, 1908). This project in total extracted some 71006 cubic ‘shaku’ of timber from these ancient forests. Before this new forestry legislation was brought into force, Korea’s total forestry stock under the control of the state was reviewed and assessed (“With the object of protecting as well as utilizing the States forests…” (GGC, 1909), and the outlines of extensive surveying of private forest resource were unveiled. This surveying took the form of cadastral surveying carried out during the spring and summer of 1910. By August the peninsula’s entire forest stock (other than on Jeju Island), had been surveyed and was found to stand at some 16,000,000 Cho. This wider stock was found to be in similarly denuded and degraded conditions as the initial State Forest stock and thus wider strategies of afforestation were to be carried out. By this year of course the Government General had assumed political sovereignty on the Peninsula and the need for “model afforestation” centers under the control of Japanese experimental institutions was no longer necessary. Forestry management was thus devolved back to the Provincial administrations now coordinated by the Government General, and afforestation strategy undertaken by the propagation of a number of ‘seedling bed’s in different Provincial territories. The Government General also sought to encourage other, private sector based stake-holders to begin afforestation projects and asserted that “…In order to encourage afforestation on the part of the general public the Government General (selected)…April 3rd, 1911, the anniversary of the accession of the First Emperor of Japan, as a memorial day for a universal plantation…” (GGC, 1911). Having gained institutional and sovereign control of the Korean Peninsula, its institutions and forest resources, reviewed those resources and begun a series of afforestation projects, the aforementioned legal revisions came with Serei (Imperial Decree number 10), issued through the Govenor-General in July of 1911. 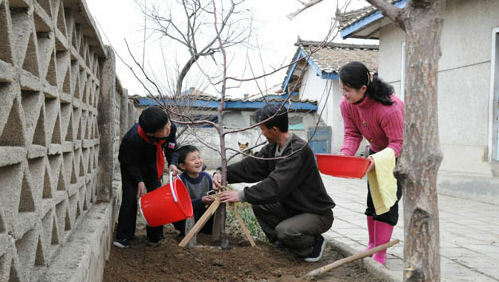 Its stipulations came into force at the end of the year and both asserted the Government General’s overall control of natural and forest resources at the same time as opening up State Forests to both preservation and exploitation by private or non-state actors. Ultimately the Annual Report for 1912 suggests that “…the vital object of the revised forestry law aims not only as a continuance of the government undertakings to afforestation, but also at stimulating the people in general to undertake afforestation as far as possible on their own initiative…” (GGC, 1912). This transfer of responsibilities in a sense sought to break the bounds of reverence for local communities and their sacred or customary forests, as much as colonial Japanese administration would seek to break the bounds between the Korea and Koreans of the present and the Korean’s of the historical past and the historical Korea. Forestry management and resource was to be brought into modernity by a quasi-free market in forest management (be that for exploitative or regenerative purposes), one that could allow for deep inroads to be made by the institutions and organisations of Japanese colonial modernity. Dramatic developments were made in terms of experimental and exploitative forestry projects in this early colonial period, developments that would point ahead to later manifestations of colonial industrial denudations and exploitations…for example the Government General Annual Report for 1912 already reports some 1649 Cho of seedling beds within ten years for future exploitation. Of course these reports from the colonial Government General are subject to some disputation on statistical grounds, as well as we will later on see on conceptual or ideological grounds. Andrew Grajdanzev for example in 1944 utilising a later set of data points provided by the Government General of Chosen asserts that comparisons and reportage made by the Annual Report of 1938 “…are of doubtful value…” (Grajdanzev, 1944,p.123), owing to their failure to correctly combine and account for different methods of forest stock assessment in the later years of the colonial government. Further to this Grajdanzev asserts that in later years the Government General undertook large scale privatisation of forest resources, utilizing the tools of modern, Liberal legal frameworks into the hands of companies such as the ‘Chosen Ringyo Kaihatsu Kabushiki Kaishi’ or ‘Corporation for the Development of Forest Exploitation in Korea’. In fact Grajdanzev notes that this particular organisation was granted for no charge some 500,000 cho of forests in Korea (equating to a quarter of the remaining ‘good’ forest) (Grajdanzev, 1944,p.126). This was not to engage in its afforestation or protection, for its whole scale deforestation. Accordingly Grajdanzev and the Government General itself (in reports not directly accessible to the author), recount the increase in cubic meterage of timber felled across the peninsula from some 700,000 in 1910 to 2.8 million in 1939 (Grajdanzev, 1944,p.124). 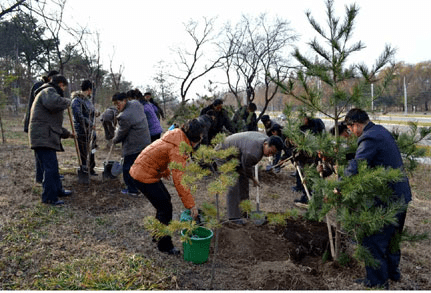 While the reports continue to recount in meticulous detail the modernisation of Korean forestry stock and practice, producing what …refers to as the colonial modern. In the later period of the colonisation the nature of what is meant by forestry practice following Grajdanzev’s analysis, radically alters. Perhaps this is to take into account the needs of Japanese military build-up and the eventual undertaking of the conflict in the Pacific and South East Asia. Whatever the impetus or drivers behind this process it seems from 1933 developmental paradigms and practices changed to one’s of deforestation and extraction. While this of course denuded forest stock to a much greater extent than the earlier period (in which there was an expansion in resource levels as shown by Grajdanzev), the later impact on North Korean conceptions of Japanese impact on the environment in general in North Korea was much greater. Cho is a Japanese measurement of area. A Cho is equivalent to .9917 of a hectare. Biography of Kim Jong-suk. (2002) – Kim Jong-suk: A Biography. Pyongyang, Foreign Languages Publishing House. In a series of pieces for Sino-NK known as “…and did those feed in ancient times…” during 2015, this author examined in detail the narratological and political content and technique generated and suggested by what North Korea had described as the “250 Mile Schoolchildren’s march”. For more than a week a group of schoolchildren re-enacted Kim Il-sung’s journey which would lead him out of colonial Chosen to the terrain in which he was later to become a General of Paektusan and Eternal President of North Korea. It was an extraordinary event rich in connection and intriguing in its presentation of its participant children as worthy inheritors of the charismatic revolutionary flame and vessels for its contemporary re-territorialisation. It was always fascinating for its skirting of the obvious and significant fact that unlike Kim Il-sung, Kim Jong-suk or in fact any of those revolutionary progenitors of Pyongyang’s contemporary charismatic, theatric politics, none of the school children on the march nor any its’ of current inhabitants could be useful or legitimately be allowed the chance to cross the rivers of the Amnok. Instead this contemporary manifestation of political charisma were to be innately and impossibly bound by their temporality and geography, their journey and its power limited and restricted by the current remit of Pyongyang’s sovereignty. The 250 Mile Schoolchildren’s march however was an intriguing and seemingly new tool in Pyongyang’s armoury and repertoire of theatric and commemorative practice, one replete with possibility given the extent of North Korea’s potential and predilection from and for the generation and exploitation of powerful narrative (imagined, constructed or otherwise). It would not of course have been surprising if North Korea’s propagandist or presentational authorities were to have put the practice to further, more developed use or in order better to extract further charismatic power and reflection from its utility. As 2015 is a year rich in moments of commemoration and memory those interested and focused on such matters would surely not have long to wait, and indeed so it was to be. This initial report focusing on the setting out of those involved also cites its moment of departure, as might be expected, from one of the most charismatically important terrains in North Korea, the Samjiyon Grand Monument. The politically sacred architecture of this place and others near it geographically, commemorates the mythography of struggle undertaken by Kim Il-sung and his guerrilla band in the hills, mountains and wildernesses to the north of the lake, as well as the coyly expressed moment in which the relationship between Kim Il-sung and Kim Jong-suk that would produce Kim Jong-il as its offspring was first denoted in the historiography of North Korea. 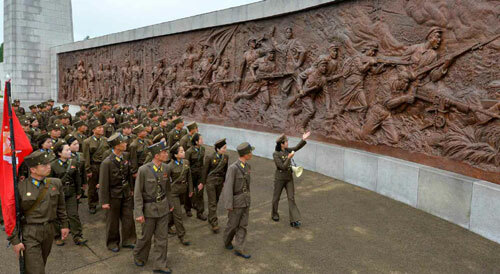 The statues and commemorative landscapes of this space are extraordinary, even in photographs and the report asserts that “the relay would offer a good occasion for arming the servicepersons with the revolutionary spirit of Paektu.” Of course it would not be the first time in 2015 that the famous mountain holy to the politics and historiography of North Korea has been mentioned by Pyongyang’s political writers and reporters. Most importantly Kim Jong-un’s New Years Message explicitly framed 2015’s North Korea’s institutional and political year within the commemorative space of Paektu, articulating a new revolutionary spirit “the spirit of the blizzards of Paektu.” Accordingly and physically manifesting this spirit, the participants in the relay would re-territioralize its imperatives elsewhere in North Korea, taking two journeys through the nation and eventually arriving at Panmunjom on the DMZ (the better to represent the notion of national reunification to actually physically appear at the division which would need to be overcome in that instance), as the report makes clear “a red flag embroidered with the letters ‘the revolutionary spirit of Paektu, the spirit of the blizzards of Paektu” in hand. 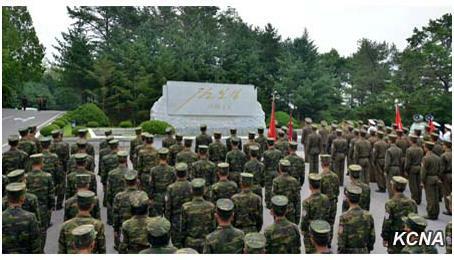 After finally on August 14th, visiting Jikdong Pass, Height 1211, Chol Pass and Mt Osong (reported as being “the mountain of Songun”), met with a group of war veterans and perhaps as a nod to the important activities commemorated in the first march of the schoolchildren in 2014 engaged in a “river crossing”, the relay groups arrived at their destination. Assembling in front of the monument at Panmunjom inscribed with Kim Il-sung’s signature on August 17th, those who had participated in the relay were joined by members from all three of North Korea’s military forces, members of the Workers Party and the Socialist Youth League to reiterate the narrative and philosophical messages of the event. Moments of diplomacy and international connectivity were, it has to be said put to one side in an almost orgiastic outburst of re-territorialization and connection between past and present. Dynamism, final victory, advance, reunification and revolutionary spirit were called upon to legitimize the relays path and arrival here at the physical manifestation of division, both a metaphorical gnashing of teeth and a reminder that with the “spirit of the blizzards of Paektu” in mind, for Pyongyang in 2015 wherever paths, journeys and travels may roamed or taken, whichever elements of charisma, narrative and authority may be deployed, October 10th and its crystallisation of North Korean political sovereignty may be the only destination. 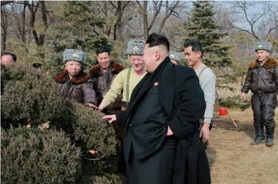 The overt singling out of Kim Jong-suk amongst all the other revered residents of the cemetery on Mount Taesong at this utterly vital moment in North Korea’s political calendar suggests that the once humble share-cropper from Hoeryong certainly has assumed a uniquely important place in the narrative pantheon of Pyongyang’s political legends. Kim Jong-suk appears in 2015 alongside North Korea’s Great, Dear and Young leaders in a way unlike any other of its citizens. Within the narratology and historiography of North Korea, Kim Jong-suk now, alongside Kim Il-sung, overwhelms all other participants in these struggles and amongst this topography. Pyongyang’s institutions urge North Korean citizens to re-temporalize and re-territorialize events from the period in contemporary time. This is done for the purposes of ideological reiteration or the transmission of political charisma — as we saw last year with the march of the school children and recently in the Red Flag Relay. ((“Red Flag Relay Groups of Service Personnel Arrive in Panmunjon,” Rodong Sinmun, August, 17, 2015.)) At the center of such drives are the experiences and encounters of Kim Il-sung, Kim Jong-suk and Kim Jong-il — but rarely are any other revolutionary Koreans singled out as exemplary. It was, as one might suspect, not ever thus; there is a substantial fluidity and transmutability of North Korea historiography and narrative. 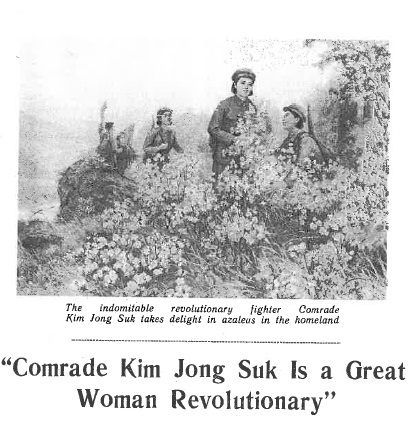 Kim Jong-suk’s own biography makes repeated reference to other participants in the revolutionary struggles, describing her companions and fellow travellers as “other female guerrillas.” These women play a role at the moment of conceptual consummation of Kim Il-sung and Kim Jong-suk’s relationship: (“Leaning on a birch tree on which spring tints were emerging, he [Kim Il-sung] posed with the commanding officers…One of them suggested to him that he should have his photo taken with Kim Jong-suk. Hearing this, Kim Jong-suk grew shy and hid behind the backs of the women guerrillas. They pushed her forward to his side. In order not to miss the moment, the “cameraman” clicked the shutter. For Kim Jong-suk, it was as good as a wedding photo.”((Biography of Kim Jong-suk (Pyongyang: Foreign Languages Publishing House, 2002), 132.)) However, they are rarely, if ever, mentioned by name and their stories are not described in any useful level of detail in the texts of Biographies or core publications directly focused on Kim Jong-suk. So where might we travel as readers and scholars to encounter or uncover the stories of other woman, a supporting cast if you like, who supported and fought with Kim Jong-suk and Kim Il-sung during the period from which North Korea derives so much of its charismatic political authority? While such an approach to historiography perhaps unsurprisingly revolves around those most important to North Korean politics, such as Kim Il-sung and his “love and care” for women, the magazine includes narratives which are occasionally contradictory to its current political mainstream. A key example is the intriguing interplay of importance and centrality focused on Kang Ban-sok, Kim Il-sung’s mother, on the pages of Women of Korea throughout the 1980s. Kim Jong-suk does not appear in the magazine prior to 1981. Between then and 1984, Kim Jong-suk and Kang Ban-sok have an uneasy coexistence on its pages, and then Kang Ban-sok disappears from the narrative, seemingly not to appear again. It seems rather clear that the emergence and emphasis of Kim Jong-suk within North Korean history and myth is was connected to the succession campaign of her son, Kim Jong-il in the early 1980s, but this is not our focus here. 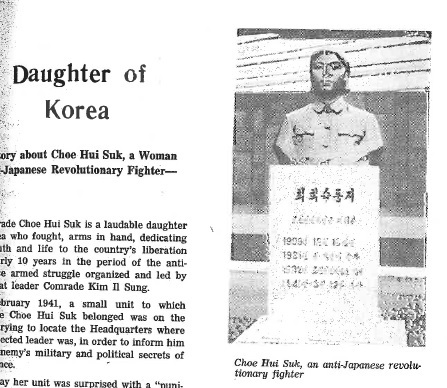 Between 1981 and 1992, Women of Korea featured an extraordinary monthly series focusing on a woman who accompanied or who was known by Kim Jong-suk during her guerrilla period. The series contains biographical details expounded about the women and their place within the wider charismatic political narratives. These articles form an important and extension corpus through which both the individual lives of these women can be glimpsed and in which perhaps familiar generic narratological tropes of the North Korean historical canon can be seen. Women’s bodies as topographies of violence | Kim Hwak-sil’s self immolation in resistance is by no means an isolated occurrence. The violence enacted by Hwak-sil on her own body and the bodies of her enemies (who no doubt died both agonizing and instant deaths), in fact becomes a key narrative and political device. The disfigurement and destruction of these women’s bodies at the hands of their Japanese enemies perhaps serves to illustrate for North Korean readers the potential violence to be enacted on themselves in the event of a future enemy victory. 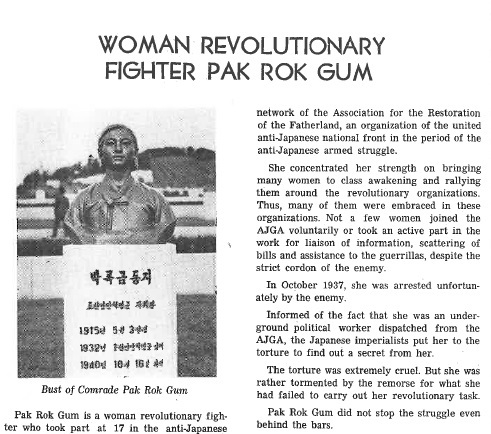 In some sense, it also echoes both the real and imagined violences of instances such as the Sinchon massacre during the later Korean War (an event very much in the mind of the commemorative authorities of North Korea at the moment).The brutality enacted upon fighters such as Pak Rok-gum whose “torture was extremely cruel,”((“Woman Revolutionary Fighter Pak Rok Gum,” Women of Korea 1 (1987): 26.)) and who was apparently thrown in a room where “those with epidemic diseases were kept” and thus “died of illness on October 16, 1940 at the age of 25″((Ibid., 25.)) is extraordinary and savage. Yet the acts and actions of these women’s deaths and tortures are presented in such a way that serves to transform them from simply gory testimonies which deny the victims of any agency. Instead they are rendered quite powerful moments of witness in which the dying women themselves testify to future revolutionary generations as to the charismatic nature and political, nationalist legitimacy of their cause. Pak Rok-gum while dying in prison coined a song with the verse “the red flag of the masses/covers the corpse of the fighter/the blood dyes the flag/before the corpse cools,”((Ibid.)) suggesting the transfer and rescaling of charismatic and nationalist power through violent death and narrative transfiguration. This essay ends with the most extraordinary and violent narrative of them all, which really illustrates the intertwining of these women’s lives and deaths with North Korea’s political charisma and the potentially vital message for its future citizens. Through the story, the state argues the immolation and immersion of the needs and lives of the individual is sometimes an important and necessary process for the eventual success or utility of the collective. Choe Hui-suk died on March 12, 1941. As rendered in Women of Korea, her death serves as the ultimate testifier at the altar of North Korea’s revolutionary period and its nascent political charisma, one whose political presence colours much of the later narrative focused on Kim Jong-suk. It is a telling absence in today’s North Korea that Hui-suk and these other women, having died horrendous deaths for the North Korean revolution, have been left behind by its narratives. Kim Jong-suk, as positioned by those who control her position in the histories, has subsumed the tropes of their narratives, effectively absorbing and embodying the political power generated by their deaths. Perhaps the urgency and pain of their annihilations perhaps is no longer necessary in the age of the Young Generallismo. Yet an encounter with the texts of Women of Korea and this charismatic supporting cast can revivify their presence in the mind of any reader. Following on from my 2013 article “Patriotism begins with a love of courtyard,” which focused on a particular extraordinary campaign of political narrative from North Korea revolving around the patriotism of one family unit in Pyongyang and their embedding of current charismatic political forms within the space of their own house, the author now further considers the utility of that campaign and the political methodologies and strategies which it might represent. Deploying in particular a conceptual framework derived originally from Cartography and recently reconfigured to support the empirical goals of human or political Geography, namely Scales and Scaling, this piece moves beyond and around the initial campaign, considering other campaigns and narrative projections. Ultimately it conceives of the process, in the context of North Korea’s political articulation as a carrier signal for its charisma. This article is a shortened version of a full length academic article published in Tiempo Devorado, the Journal of Consumed Time, published by the Autonomous University of Barcelona. So before we turn to Ri Song-ryong and his family around their courtyard perhaps addressing the more general nature of patriotism might be helpful. When we do so in the more conventional social and political productions of the contemporary wider world there appears a particular texture and tone to the conception. Having been rehabilitated from enlightenment critiques, Jean-Jacques Rousseau’s co-option of nationalistic fervor to underpin the modern nation-state and its democratic ideals (so under threat according to Rousseau as to require constant patriotic buffering), patriotism now serves generally the nation-state and its governmental-political-industrial complexes. Citizens are patriotic when they celebrate their nation’s success in war, defend it from defeat and subjection, resist the oppressor, commemorate the hero, and successfully marry their own personal commitments to wider repertoires of social and politically acceptable practice and praxis. North Koreans, therefore, in an age of what has been termed Songun (military first politics), can easily be imagined would be considered appropriately patriotic if they celebrated their nation’s military altercations with its enemies, they would be patriotic if they expressed loyalty to their political and scientific leadership when they developed new technologies of resistance or defense and they would patriotic when they commemorated the historical narratives of struggle against past colonizers and subjugators, in particular the Japanese. Of course, in a sense, this is very much so, especially in the presentation given by North Korean media output and official publications and as readers will know Pyongyang has an elaborate and extensive socio-cultural system of commemoration of national heroes and liberators. 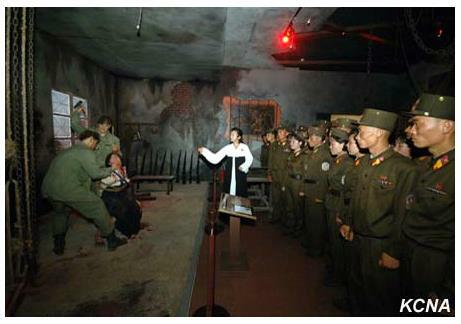 The Revolutionary Martyrs Cemetery, Victorious Fatherland Liberation War Museum, Sinchon Massacre Museum, and innumerable memorials, statues, and pilgrimage sites scattered around the country make sure that the citizenry of North Korea do not lose focus on the nature and importance of their nation’s military and liberation struggles. An equally extensive temporal repertoire of commemorative events, days, programs, and festivals embeds these spaces of commemoration within a calendar of patriotism, which impacts deeply on North Korean’s social and political lives. Such cases and their articulation of a patriotic sensibility are, of course, singularly aggressive and combative. They are also in a sense exclusionary and cannot hope to include the entirety of North Korea’s population within their repertoire of practice and action, as not everyone can currently be a member of the service personnel (even in such a highly militarized state as North Korea during the reign of Kim Jong-il). But North Korean political narratives demand universality of applicability and connection, and ultimately patriotism must have a mode in which it can be diffused beyond the scope and spaces of military and service personnel. This paper wishes to assert that just such a diffusion was undertaken within Ri Song-ryong’s courtyard. What the campaign within this familial space permits is a scalar shift in ideological and narrative manifestation from the grand, national, and institutional level to more approachable, local, and familial levels, through the construction of social-political relations at that level. At this scale patriotism and their enactment and construction into nature and the environment are translated to a more social level, the political and Party thematic, embedded within personal interactions and relationships. As Swyngedouw and other social or critical geographers might see it, here the state is empowering itself through enacting and re-embodying social processes within the landscapes of personal and familial life. Revolutionary Modeling and Rescaling | It must be apparent that in some senses Ri Song-ryong and his family are classical and typical revolutionary models, in the Maoist or Stakhanovite sense. Embodying correct socio-political practice through a rescaling of political narratives and processes from the grander scope of national and historical scale (in which legendary or slightly abstracted individuals or communities accomplish something apparently unlikely or near impossible), to the local, contemporary scale (in which you, the reader, the participant, must interact and accomplish those practices within your own life), revolutionary modeling in North Korea in general has manifested around the personages of the Kim family, or those groups of politically committed revolutionary pioneers that forged either the initial institutions and structures of North Korea or fought for the eventual liberation of Korea during the pre-colonial times. Ri and his patriotic family however represent the re-scaling of the notion of the revolutionary model into a different landscape. Leaving behind Ri, his family and their courtyard for socio-cultural spaces elsewhere in North Korea, but spaces nonetheless that are re-scaled through the process of revolutionary modeling to become socially and ideologically exemplary in such a way as to privilege processes over rather more dramatic outcomes. It is something of a cliché to declare that Pyongyang’s roads have rather less traffic than is usual for an East Asian city. In recent years North Korea’s Party and institutional elite appear to have bought many more vehicles and its roads have much more traffic. This has not so far encouraged Pyongyang’s city authorities to invest in more traffic lights and other organizational infrastructure, accordingly drivers at its intersections and junctions are still directed by a group of fashionably uniformed police women known as the Traffic Command Corps. These woman have been the subject of the academic and touristic gaze in the past, and the focus of Kim Il-sung and Kim Jong-il’s interests, but 2014 saw an extraordinary moment of focus in which a member of their team gained international prominence. Rodong Sinmun and KCTV were, even given their initial reporting of such an apparently important moment, not entirely clear as to what had actually occurred. But it became apparent that Ri Kyong Sim had in the midst of a traffic accident rescued or protected a pair of images of Kim Il-sung and Kim Jong-il. Images of the leaders (and of Kim Jong-suk, Kim Il-sung’s first wife, and Kim Jong-il’s mother) are protected by law in North Korea, revered objects which serve to remind citizens of their position at the base of the revolutionary pyramid, to assert and reinforce the regimes assertion of “fatherly love” and to transmit its perceived charisma and authority. 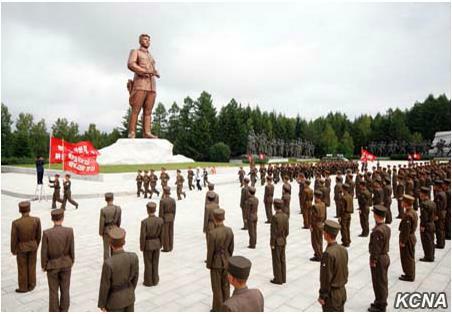 There are a number of examples during the guerrilla period in which Kim Il-sung and his fellow supporters fought and harassed Japanese forces on the borders of Korean and Manchuria and from during the Korean War, when representations of important figures and physical relics of moments in those key struggles in the construction of North Korean national identity and mythology become vital to current political commemoration. Ri Kyong-sim, it seems, was to be a new defender of such revolutionary narrative and imagery, her act of defense a rescaling of more urgent narratives of both national construction and defense, in line with Swyngedouw and others conception of this process’ production of embodied social and political relations. Ultimately this was made even more explicit by the KCNA’s assertion later in the month that Ri “devotedly defended the security of the headquarters of the revolution in the unexpected situation and rescued portraits of the great men of Mt Paektu.” The process of social and political production rescaled in the contemporary North Korean present right back to the semi-mythic period of the resistance to colonial power and subjectivity. While Ri is by no means the only individual or group of individuals whose contemporary experience or interaction with a landscape impacted or embedded within North Korea’s charismatic political narrative is rescaled through this process of revolutionary modelling so as to support the transfer of that narrative and its charismatic content from one scale of socio-political relations to another. In 2014 and 2015 for instance, scientific endeavour and academic research has been a key element of North Korea’s developmental agenda. 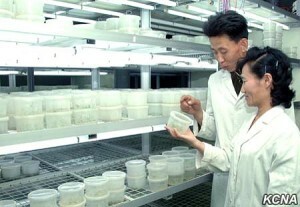 Rodong Sinmun in particular has carried a number of picture articles focused on institutions such as the Academy of Koryo Medicine, the State Academy of Sciences, and Biotechnology Branch Academy. In all of these articles groups of scientists are shown engaging in their particular specialism surrounded by the landscape determined by their empirical methodologies, such as research greenhouses, clinics with medical facilities and laboratories replete with autoclaves and other technical paraphernalia. These are scientists and researchers from our contemporary time, entwined with the landscapes of North Korea and the context of its socio-political relations: as they currently manifest. However Rodong Sinmun also editorialises their activity in language such as “our scientists and technicians serve in advance units in the decisive battle for the defense, system and life…. For them there is no fortress invulnerable. They are revolutionaries….” Just as Ri Kyong Sim’s contemporary encounter with the landscape of charisma is rescaled, these anonymous scientists and academics find their everyday research terrain transmogrified into a revolutionary space, a landscape akin to the de-temporalized and de-territorialized truly charismatic landscapes of North Korea’s nationalist mythologies. Sui generis descriptions of North Korean politics are, as we have made clear many times on Sino-NK, neither analytically useful nor empirically valid. North Korea’s politics is not unique and plenty of other nations have sought to maintain political and social infrastructures and approaches similar to it. Other nations have also acted diplomatically or militarily in ways the roots, ambitions, interests, and outcomes of which were hard to discern. Other nations have even sought to utilize extensive cults of personality. That is not, however, to say that politics and the articulation and manifestation of political narratives in North Korea does not do interesting, sometimes extraordinary things that are worthy of study. This piece’s framing of the impact and outcomes of North Korean political campaigns, their embeddings, enactments and articulations through the lenses of Kwon and Chung’s charismatic and theatrical politics, Castree, and Cosgrove’s symbolic, socially, and politically constructed landscapes, and Smith and Swyngedouw’s reconfiguration of the nature of scaling, from one of pure cartography to one of social and political analysis and comment, has, it is hoped, allowed the reader to encounter such political interactions in a new light–in a sense for them to have been rescaled themselves. As Kwon and Chung make clear in their analysis of North Korean political interactions, it is not enough for a political figure, element, narrative or instance to simply be charismatic, its charisma cannot simply be innate, it is must be actioned and actualized through an enacting and performance in theatrics. Thus these campaigns as they are experienced on paper or as they are interacted with on the ground by North Korean citizens are not simply static moments of assertion, but through the act of rescaling become re-territorialized and re-temporalized in the experiential present. Rescaling allows the witness or viewer to experience something of the content of their charisma. Ri Song-ryong’s courtyard would simply be a picture of Ri Song-ryong’s courtyard on the page or on the screen, were its articulation not ultimately an act of rescaling. The transfer of one thematic or element of political charismatics from one scale to another, whether temporal or topographic (national to local, historical to contemporary for example), transmits and transforms the social-political process and its interaction with those landscapes and terrains involved, one to another, the act of transmission itself serving as a carrier-signal for the transformation. In this way rescaling itself becomes an actor in the social-political process of North Korea’s charismatic politics, as much as those landscapes or participants who are themselves rescaled. Through such carrier signals, the spatial reality of Ri Song-ryong’s courtyard in Sowon-ri can be transformed into any courtyard and Ri Song-ryong’s expression of patriotism through enactment on his own landscape can become any citizen’s patriotic expression. Alexey Vorontsov, “North Korea’s Military First Politics: A Curse or a Blessing,” Brookings Institute, May 26, 2006 (accessed July 24, 2015). Suzy Kim, “Specters of War in Pyongyang: The Victorious Fatherland Liberation War Museum in North Korea,” Cross-Currents: East Asian History and Culture Review 14 (2015): 124-151 and Adam Cathcart, “Museum Pieces: Kim Jong-un, the Korean War and the shadow of Maoism,” Sino-NK, August 5, 2014 (accessed July 24, 2015). Judith Shapiro, Mao’s War Against Nature (Cambridge: Cambridge University Press, 2000). “Thoroughly Embody Kim Jong-il’s Patriotism,” Rodong Sinmun, December 11, 2014 (accessed March 29, 2015). Erik Swyngedouw, “Excluding the other: the production of scale and scaled politics,” in Geographies of economies, Roger Lee and Jane Wills (eds.) (London: Arnold, 1997), 167-176. Neil Smith, “Geography, difference and the politics of scale,” in Postmodernism and the social sciences, Joe Doherty, Elspeth Graham, and Mo Malek (eds.) (London: Macmillan, 1994), 57-79. Mitch Meisner, “Dazhai, The Mass Line in Practice,” Modern China 1 no. 4 (1978): 27–62 and Xin An Lu, “Dazhai: Imagistic Rhetoric as a Cultural Instrument,” American Communication Journal 5 no. 1 (2001): 1–26. Robert Winstanley-Chesters, Environment, Politics and Ideology in North Korea: Landscape as Political Project (Lanham, Maryland: Lexington Press, 2015). Charles Armstrong, “The view from Pyongyang,” The New York Times, August 15, 2012 (accessed July 24, 2015). 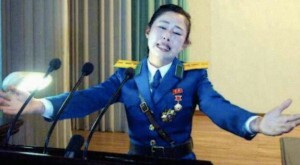 Gareth Mizrahi, “The North Korea Traffic Girls,” The North Korea Blog, May 22, 2013, (accessed July 24, 2015). Tania Branigan, “What we know about North Korea,” The Guardian, August 6, 2009 (accessed July 24, 2015). “North Korean traffic cop may have saved Kim Jong-un’s life,” The Daily Telegraph, May 9, 2013 (accessed July 24, 2015). “DPRK Hero title awarded to traffic controller,” KCNA, May 5, 2013 (accessed July 24, 2015). 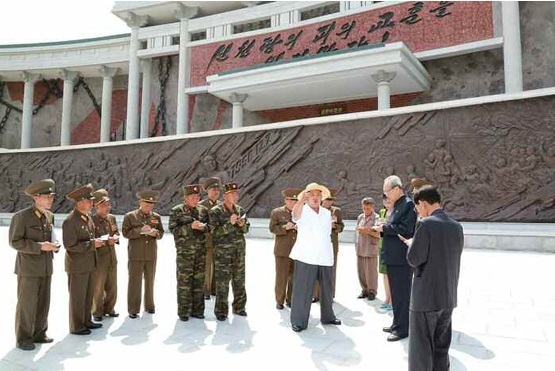 “At Academy of Koryo Medicine,” Rodong Sinmun, May 5, 2014 (accessed March 29, 2015). Swyngedouw, “Excluding the other” and Neil Smith, Uneven development: nature, capital and the production of Space (Oxford: Blackwell, 1987). “Many models in new era produced in DPRK,” KCNA, May 31, 2014 (accessed July 24, 2015). 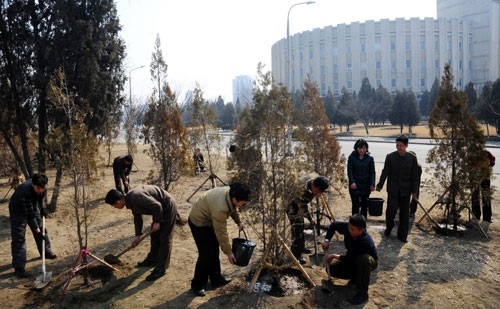 “At State Academy of Sciences,” Rodong Sinmun, February 10, 2014 (accessed March 29, 2015). 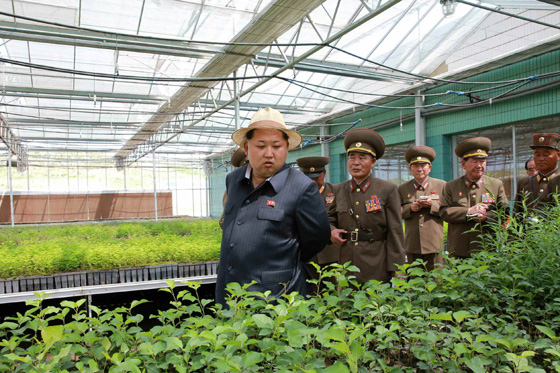 “At Biotechnology Branch Academy of the State Academy of Science,” Rodong Sinmun, March 15, 2014 (accessed March 29, 2015). 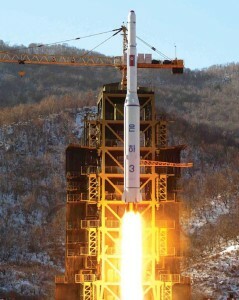 “Scientists must discharge their mission with honour,” Rodong Sinmun, April 8, 2014 (accessed March 25, 2015). Heonik Kwon and Byung-ho Chung, North Korea: Beyond Charismatic Politics (Lanham, Maryland: Rowman and Littlefield, 2012). Denis Cosgrove, Social Formation and Symbolic Landscape (Madison, Wisconsin: The University of Wisconsin Press, 1984).